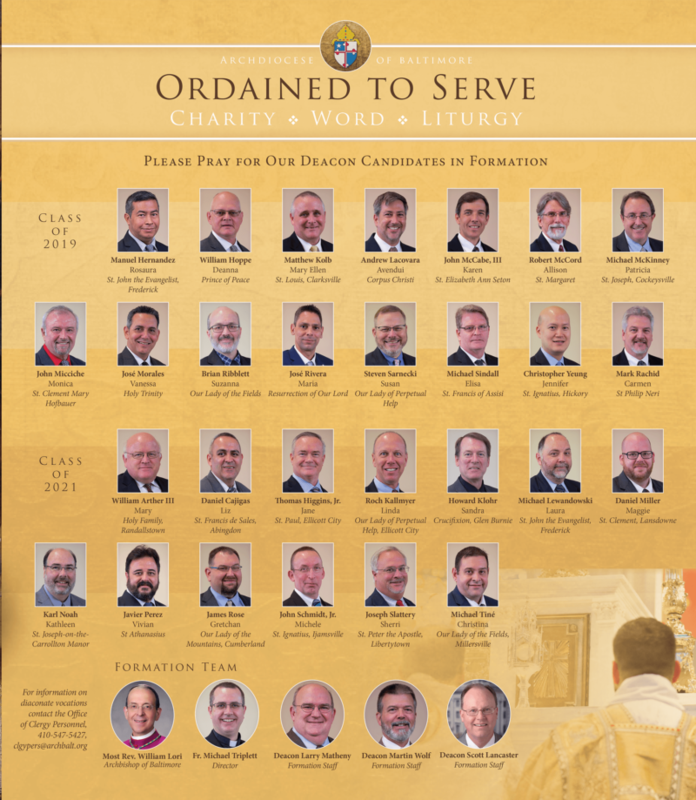 Whether you are a deacon or you are interested in finding out more about the diaconate, we hope you will visit these pages often. We welcome comments, suggestions, and questions. If you wish to learn more about the diaconal requirements and formation, please contact the Office of Clergy Personnel or call 410-547-5550. As the Church strives to hear God’s call to “feed his sheep,” the deacon’s identity reminds and encourages the entire Church to engage in the works of mercy, both spiritual and corporal. The Archdiocese of Baltimore is currently hosting information sessions for gentlemen interested in learning more about the role of the deacon and process of applying. Even if you doubt that you have a vocation to the diaconate, but have a family member, another parishioner, or a deacon or priest who has encouraged you to think about the diaconate, come learn more. Please help the formation team by registering with Kristine Arata, Kristine.Arata@archbalt.org. Applications are only available to those who attend an information session, or after special consideration with a member of the formation team: Father Mike Triplett (mtriplett@archbalt.org), Deacon Larry Matheny (lmatheny@e-stignatius.org), Deacon Marty Wolf (mwolf@stmargaret.org) and Deacon Scott Lancaster (slancaster1@stlouis.org).